I have two troublesome areas that keep bothering me. They bother me because i just cannot for the life of me think what to put there. I want something of interest, which is why i have called upon the kind community to give me some inspiration. The first of the two areas is the back right hand corner. To the left of it there is a small town scene. I didn't know whether to carry on this town scene or just switch things up a little and add something else. What are your thoughts? 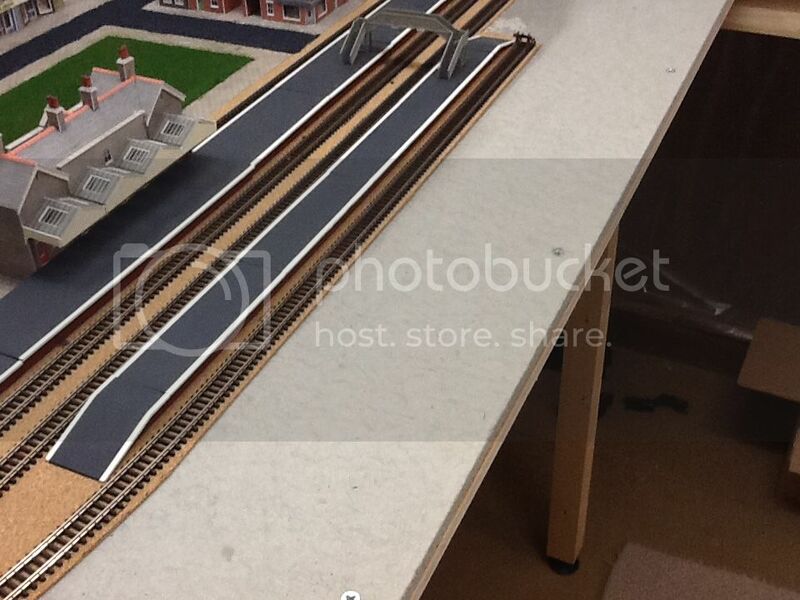 Lastly, the second of the two areas is a small area right infront of the station and on the edge of the baseboard. The station is the main focal point of that baseboard as it is right in the centre of it, so i wouldn't want anything to block the view. Have you got any ideas? This is just another view of the area infront of the station, i find it hard to imagine what would go here, and what would look good here. I have been stuck on these areas for a little while now, so any inspiration would be wonderful. Thank you for stopping by, and have a great day. I think it could do with more homes and perhaps a factory behind them for employment in the area.... or a park on a hill behind them for recreation for the residents maybe with a cliff dropping down to track level on the bend. 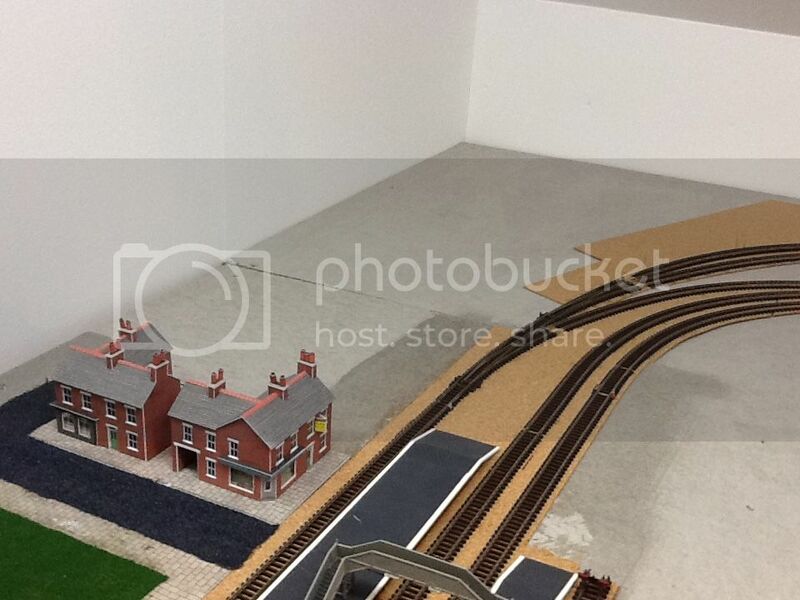 And by the station perhaps some extra storage as you have 2 bay platforms (Or a run around loop past the front bay platform) ....and / or an allotment as that wouldnt be too high in front of the station. Have you given any thought yet to a backscene. After all the general shape of the land would be what was there before the railway was built. If it hasn't been built over it will be an extension of whatever goes in the corner. Merging foreground and background can be tricky, it helps if the join would be obscured by a wall, hedge, fence or even just some raised ground. Modelling the change from built up to open scenery can require a lot of space so it's best if the change happens "off scene"
Whilst on the subject of backscenes make sure that it is curved... The Sky doesn't have right angle corners!! Not Every ones cup-of-tea, but I can see a canal with a lock (or two). If you go with this please make sure that the lock gates are the right way, both double and single gates open towards the higher level, so that the water pressure keeps them closed. I have put a large-ish church on a hill on one corner. It will also include some trees and a cemetery. For the second back corner, I have planned to put a farm (mostly using Skaledale Holly Farm components), with a little terracing of a shallow hillside. For the third rear corner, I have not yet thought of anything. 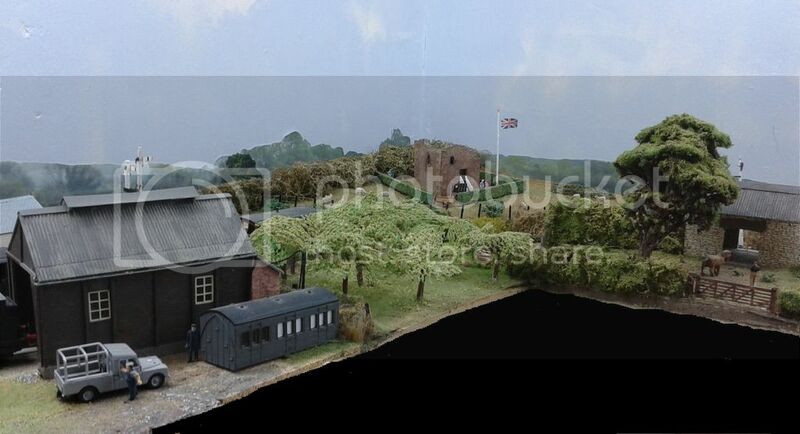 Here's some piccies of how I handled the change from 3D to 2D where the modelled scene meets the backscene. They might just help you envisage how to handle that back corner. Here's the bridge with a bit of the road showing in the distance, but the immediate join is below the crown of the road. This is where my urban scene merges into the country beyond. Chopping off the lower floor of the houses suggests there's a back garden behind the wall. Now that's not another corner in the sky, the corner is behind the water tower, what looks like a sharp edge to the cloud is caused by additional light from the tube lighting the back wall. Sometimes you just can't win. Hope there's a bit of inspiration in there. Definitely something raised for the corner. Apart from anything else, it gives a reason for the tracks turning away from it. In front of the station: just asking but have your controls got a proper home as yet? 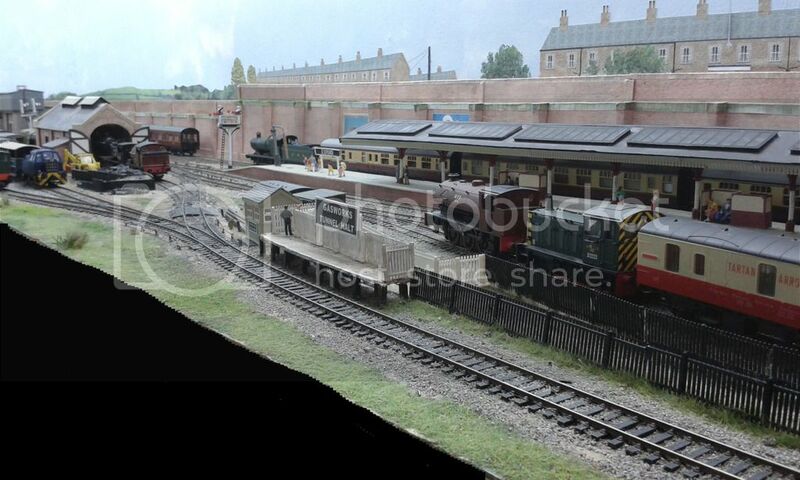 A factory yard wall could then define the end of the scenic space. The more modern you are, the more likely it is to be a car park! Sorry, I couldn't find the photos in a hurry to illustrate my previous post. this is still very much under construction, but may serve to inspire. 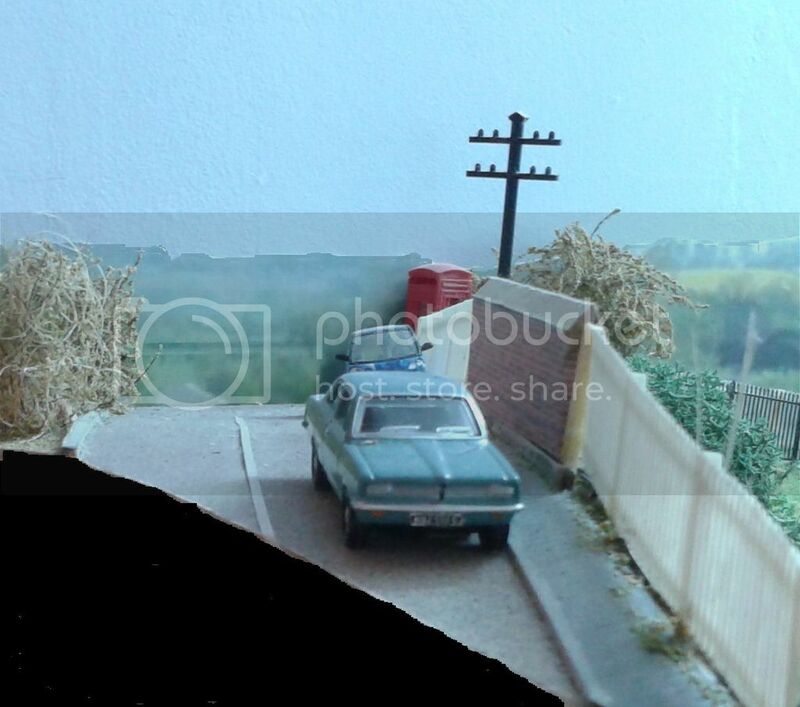 Having the raised scenery leading to the corner does make it easier to disguise the break; this is somewhat like John/Bufferstop's raised hill with tower (?) and flag. I am still looking forward to a time when I can put my backscenes up. 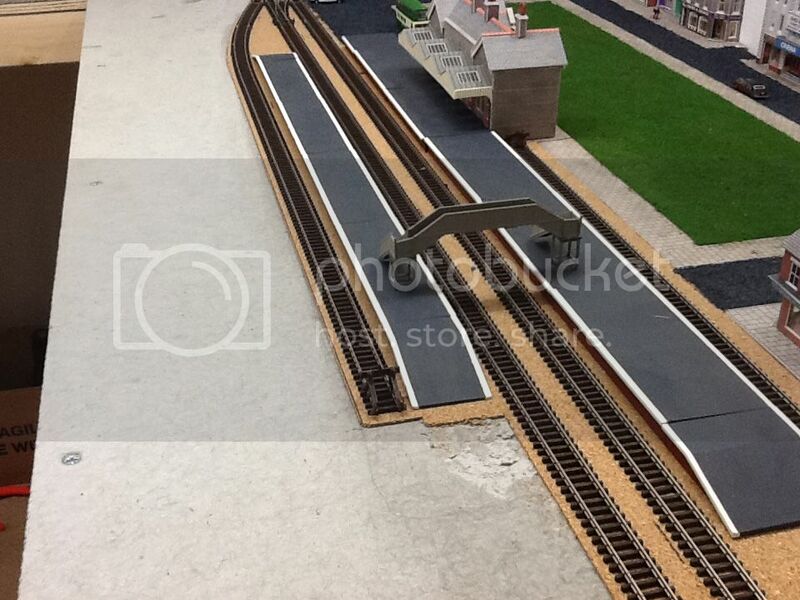 They have to await completion of tracklaying, ballasting and third rail laying.